To make gluten free: Check your broth to be sure it does not contain gluten. Omit the flour and substitute with a cornstarch/water combination. 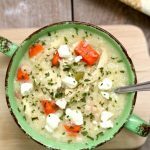 Omitting the Feta can I make this soup the day before and gently reheat it? Easter is a big celebration around here and I would like to start with your soup. I bet that would work! P.S. All of your recipes turn out great. Just made this and finished eating it with my hubby. He said, “This is AWESOME!” The only changes I made were to use a regular sized bag of frozen peas and carrots (thawed and the water drained off) and (based on a similar recipe and because we like dill – added 1 T + 1 tsp dried dill). So very GOOD!! Oh. I didn’t have feta on hand, so we each mixed in a Tbs or so of blue cheese crumbles. It was perfect! I’ll be sharing this with my daughter and daughter-in-law to fix in their instant pots! The hubby and I each ate 2 bowls and have about a bowl and a half left for lunch tomorrow. PERFECT!! Thanks for your comment Kari! I’m so glad you enjoyed it! This was gourmet quality when made exactly according to the recipe! (Except I added a wee bit more lemon juice — juice of 2 lemons). The chicken was so tender and shredded easily using this method. Alas my husband loved the soup except for the lemon taste!!! Go figure. Next time I’ll just add lemon juice to mine in the bowl! I love the extra lemon yum yum! Just sat down with a bowl of soup. I started it about 35 minutes(including cleanup) I never anticipated the brite rich flavor I usually get with hours of cooking on the stovetop. I loved your recipe and kept everything as you suggested. Delicious. 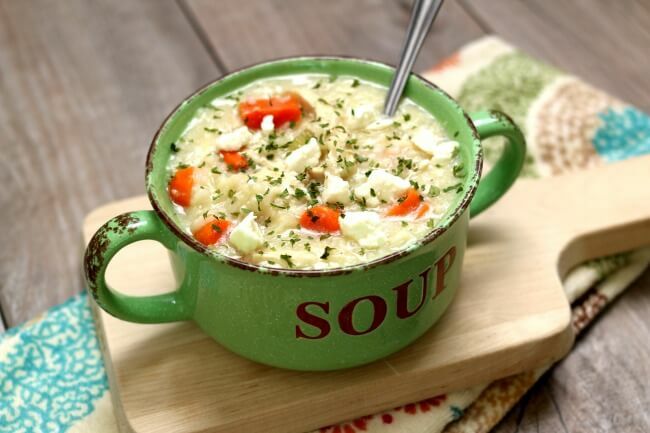 I just love the lemon flavor that comes through on this soup! Karen I’ve looked at a few recipes, and yours looks like the best, using more ingredients and really using that IP to full potential!. My question: how long should I cook the chicken with short grain white “Calrose” rice? I’m thinking about cooking it with whole chicken breasts. I’d cook for 8 minutes. So I read this recipe several times, and I don’t see when to add in the rice? Does it go in with the chicken? Absolutely perfect! Thank you so much for the recipe!! Love it. For low fodmap I switch the onion for the green part of green onions. Also added extra lemon juice and zest and lots of carrot and celery. So good and so easy! Thank you for this recipe! It is definitely a keeper! Can you cook chicken from frozen? The problem with that is they won’t cook at the same rate as the rice. I bet it would work with frozen chicken tenderloins though. 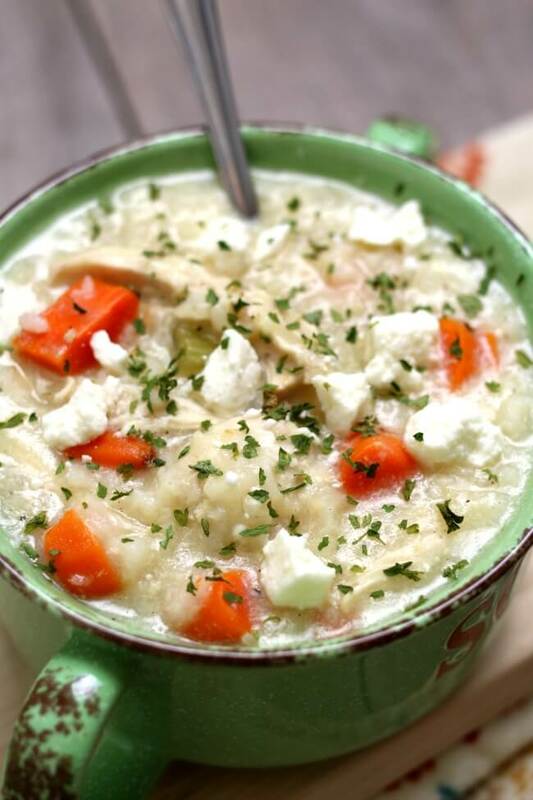 Could you make this with orzo? You probably could. But I wouldn’t pressure cook the orzo. It will be done well before the chicken and get mushy. I would add it in after the chicken is cooked and use the saute function to boil it. Or cook it on the stovetop. Could I use cornstarch to thicken this instead of the flour? I’m gluten-intolerant and I’ve found that the gluten free flours really tend to clump when I try to make gravy…otherwise I can follow your suggestion and just omit it. Any ideas about freezing it? I got the InstantPot like yours for my birthday and it’s my go-to cooking method now. Looking forward to more of your recipes. I just had to google FODMAP. I’ve never heard of that! 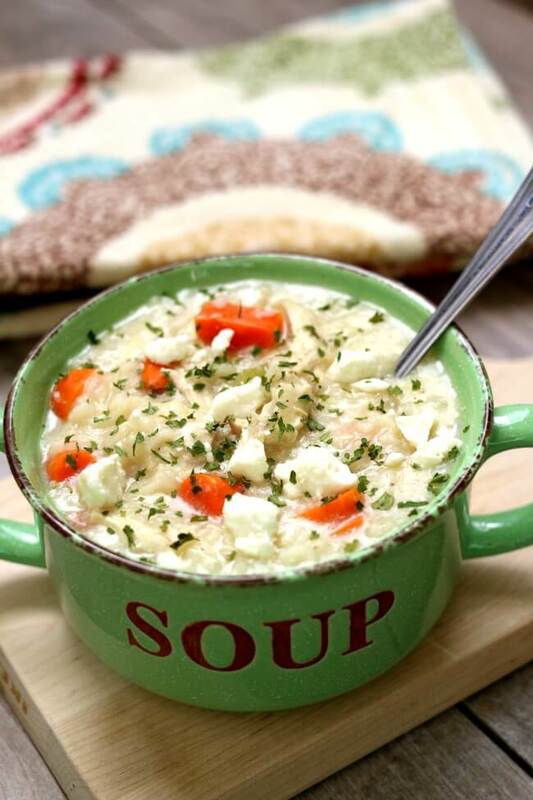 I made a big pot of this last week, hoping it would last several days for me & my husband. He loved it and asked for it to be added to my “usual rotation” of recipes. It only lasted 2 days of lunches & dinners because we gobbled it up! The lemons were such a bright addition – really made the soup special. Thank you for the great recipe! I love the lemony flavor too! Glad you both like it! Do you think I could omit the eggs? My son is allergic and I am wondering if it could thicken up “good enough” without the eggs…? Yes you could thicken without the eggs! I think it will be plenty thick with the flour/butter mixture. Hi Julie, I really love brown rice too. I want to see if this works so try it and let me know! I know usually when I cook just brown rice it takes 22 minutes. However this soup takes a while to come to pressure so I bet you could cook for 18 minutes. If you want to use chicken thighs that would probably be good too. If not I’d leave the chicken breasts whole. Let me know!!! I can’t have rice so I will substitute quinoa – will I need to adjust the cooking time? 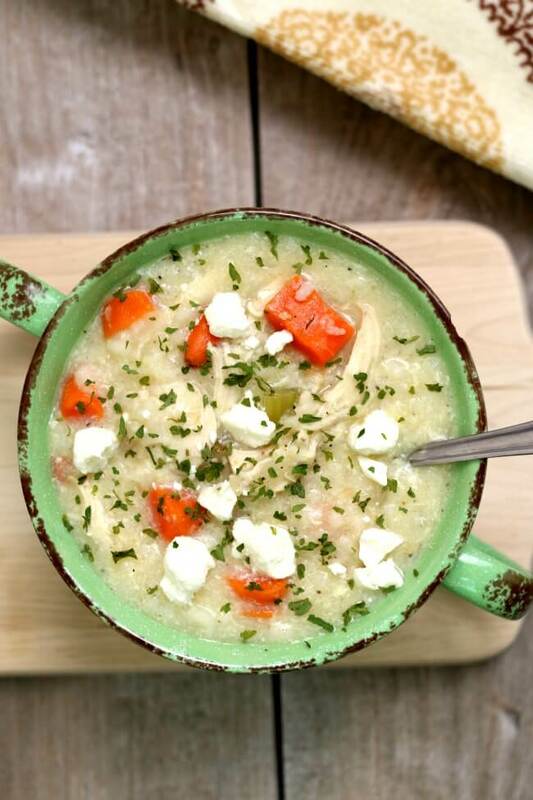 Perhaps you could add in cooked quinoa after the soup has cooked? Quinoa only needs a couple of minutes of cooking time.